The Joker see ms to have its origins in a special card used in a particular form of Euchre. In this game, which began in Alsace-Lorraine, two Jacks of the same color are designated as being especially powerful. When immigrants carried the game to the US, they also brought some of the specialized German terms, such as Bauer (= Jack). Euchre players still speak of their two highest cards as “the left and the right Bauer,” but the key word is envisioned as “Bower”. Americans added to the Euchre deck a card even higher than the designated Bowers. It was called the Imperial Bower or the Best Bower. This was the genesis of the Joker. According to the latest theory, the Best Bower alternatively was called “the Euchre card”. This could have been mispronounced as “Juker card,” which then gave rise to “Joker card”. A possible problem attaches to this theory. We have old cards labelled Best Bower and, thereafter, cards labelled Joker. 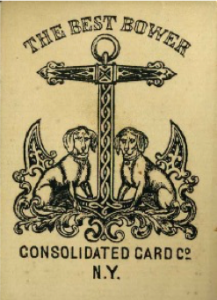 But “Eucher card” and “Juker card” have not been found inscribed on actual cards. Perhaps those transitional terms only existed in the speech of cardplayers. But nineteenth-century literature has not been found to attest to this possibility. 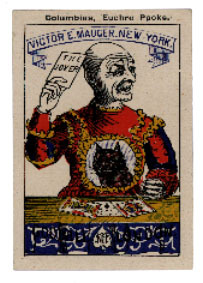 The very word, Joker, naturally could have inspired card designers to depict jesters, clowns and other pranksters. Oddly, however, the Best Bowers and early Jokers show much greater diversity. We find not only the trickster types but also children, stage characters, animals, etc. A more simple theory is possible. After the introductions of the Best Bower into Euchre, Americans equipped other card games with an extra card (usually as a wild card). Perhaps this is the stage in which the extra card became known as the Joker—meaning one that changes character or pops up unexpectedly. Designers would have tried to create some new imagery for this wild card. The choice of a jester is logical, not only because of his unpredictable behavior, but because he complements the court cards. In Europe, after all, the royal court really was home to jesters, jugglers and other entertainers. 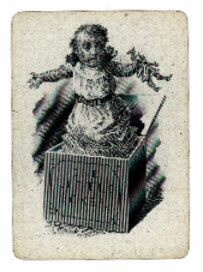 Nevertheless, it is certain that the Joker card itself was not a European invention. It is one of America’s most picturesque contributions to the history of playing cards.